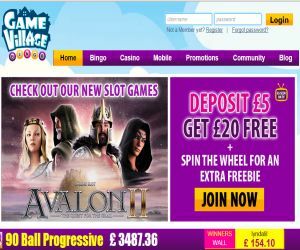 GameVillage Bingo is hitting the headlines again, for joining forces with Eyecon games to add some of the hottest slots around to its hall of gaming fame. This dream-team collaboration brings some of the hottest slots on the gaming scene to the forefront of GameVillage’s site collection. The new entertaining line-up comes in the shape of trusted classics like Sugar Train and Fluffy Favourites to Enchanted Prince and Shamam’s Dream. This unstoppable collection is already live and ready to be devoured on the mobile site, and the web version is to be rolled out soon. Game Village is really stepping up its game, after announcing earlier in the year its incredible collaboration with another industry powerhouse, Microgaming. GameVillage Bingo already boasts an established fan base due to its virtual village homely feel, awesomely unique bingo games with a twist, customized promotions, and its actual in-house radio station! These strategic collaborations with Eycon and Microgaming add to GameVillage Bingo's Cozy Games software collection. These partnerships are sure raise the industry bar, and give Game Village’s unstoppable reputation for providing top quality games- a mighty boost!